Students will be able to use art and writing to share their knowledge of what happens during the spring. Ask students if they know what the word “Seasons” means. Allow for several students to share their ideas. Explain that seasons are what we call the four different times of year that have very different weather. Not all places share the same seasons at the same time, but many places do. The seasons are spring, summer, fall, and winter. Read aloud the book Red Sings from Treetops: A Year in ColorsBy Joyce Sidman. As you read, pause to note the different things that happen during each season. Ask students to think about each of the seasons. Point to the prepared chart paper labeled with each season, and ask the students to turn and talk to a partner about what they might see in the spring. Record students' thinking on the chart paper. Repeat the activity with the remaining seasons. Refer students back to what they heard in the book as needed. Explain that students will now choose one of the things that they see in the spring to write a sentence about. They will then get to use their artistic skills to illustrate their sentences. Remind students to sound out their words by listening to each of the letter sounds they hear and using all of the sounds in their writing. Point out the list that the class created in the previous section as one place students can find words and/or ideas for their sentences. Encourage students to be creative and think about the story we read and how the author talked about colors. 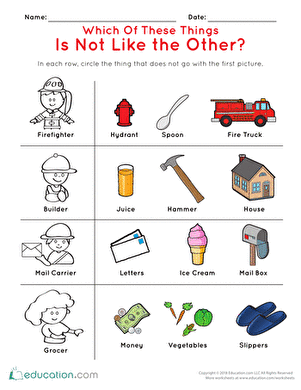 Pass out the What I See in the Spring worksheets to each student. For students who need additional support in their writing, encourage them to utilize the class word wall and/or alphabet chart when sounding out their words. You can also provide index cards with additional words pre-written for them to use in their sentences as needed. If students finish the activity early, you can provide them with a copy of the Writing the Four Seasons worksheet to complete. Collect student work samples and verify that students were able to complete a full sentence using invented spelling words that accurately represent things that are seen in the spring. Ask several students to share their illustrations and sentences with the class. Notice and applaud their invented spelling attempts. Tell the students that you would like them to think about what they have learned about the seasons and notice what changes they see happening outside right now. Encourage students to share 1 or 2 things they see happening now as an exit ticket for this lesson. This quirky language lesson is guaranteed to nourish your kindergartner's vocabulary skills.